We all have small or big plans for future, it may be as simple as finish today's work and go home or may be to buy a house or car or reaching a particular position in our professional career. Everybody has some or other goals in their mind, there is nothing unusual about it. Even a street vegetable vendor or rickshaw puller or even a beggar has a goal. However the sincerity to achieve the goal varies from person to person and hence the probability of achieving it. One interesting fact about goals, I have come across is, only 3% people write their goals. Only three percent people have their goals written and most of them who have their goals written actually achieve it. Very few of the rest who doesn't care about writing their goal actually meet their goals. I heard this long time back but never took it seriously.I thought it was so stupid like you might be thinking now If you have never tried writing your goal before. I could have never realized how just writing them can make a difference until I tried them on my own. Just writing your goals could make a huge difference and I couldn't help sharing the same. Before jumping into writing your big goals, try this, the way I started and realized the difference. Many days in your office or personal life you must have come across with very busy days. Lots of things to do, running around for people and places. Just make a To-Do list either in the morning or the night before : note down all the tasks that you need to accomplish and If possible prioritize them in accordance with their deadline or importance. 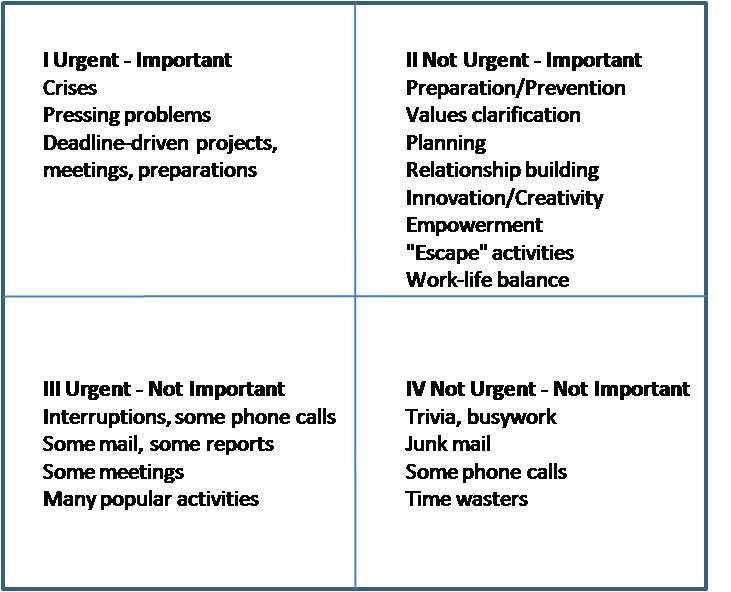 You can use the priority quadrant or use the free TO-DO software available or simply write in your diary. Complete the tasks as per their priority. Prioritize any unplanned tasks coming up and work accordingly. When I did this, I found my days were much organized. I had the clarity of what I am going to do for the day. My days were extremely productive. I could plan my days much better. I realized many of the days are not really hectic as it seemed to be. I used to spend more time in juggling and prioritizing the tasks, then actually working on it. It completely changed my work life balance. Now just extrapolate this to little longer period of time. The goal in a written form can only be Specific, Measurable, Actionable, Realistic, Time bound(SMART). The goal which is SMART can only be worked on hence achievable. Say for example you are thinking to buy a car in near future. But its not a SMART goal, just in your mind. You may buy it some day when you accumulate the money needed or make arrangements for other requirements. But If you right it down like :" I want to buy Maruti Swift by December 31st 2012" the result will be different. Your requirement is clear, you know how much money you need by that time. Hence you can plan exactly how to arrange the same, whether you have to take loan, for how much and how much you can save by that time. You will find out the waiting period for the particular model, so you will book accordingly to receive by the time. In the previous case(the goal only in mind), you may also buy a car, but may not be in a particular time frame or may not be the exact model. The goal is just a wish until its written down concisely. Then it becomes a actionable plan. You will realize what all is needed to achieve the same. The bigger goal can be divided into smaller ones in lesser time. Say a 10 year goal to yearly goal to monthly goal to even weekly or daily. Then you can align your daily tasks to your goal. The effort, the skills, investment or any other ingredients may sound huge for a 10 year period. But when you break down into daily or weekly targets it will be much more achievable. A written goal has tremendous mental effect. Quite a bit of unconscious factors work towards your goal when its becomes clear and concise in your mind. You can also put your goals(The photo of the luxury car or home you want to own or the life you want to lead) in a visually appealing manner in a prominent place where you can see them anytime. It will take your mind space, it will improve your focus on the goal and rest other things will fall short for it. You will be motivated to overcome all the obstacles as the only thing taking bigger space in your mind will be the goal. Writing a SMART goal itself is a challenge. If you have never done it before, it may seem little odd initially. But just start with your daily TO-DO list or just write down what ever in your mind as goal. Once you write your mind, you can actually visualize what you want. The you will realize how much actionable those are and you make it better, clear and more specific.Then Slowly, with time the goals will become SMART and you will be closure to achieve it. So just go and write down what you want in life without any more delay If you really want to achieve!!! THis was such an informative piece of writing ! Thanx Bhai, will try to follow SMART by putting up sticky notes and prioritizing my work.